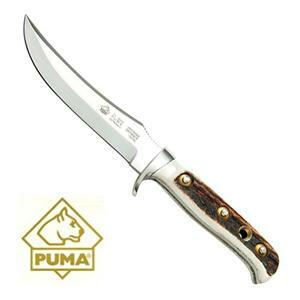 The knives from Puma's Solingen, Germany, factory always look more like weapons than the average factory-made knife, and the Puma Stag Skinner knife holds true to that. The 5-inch blade of the Puma Skinner may be technically a Bowie style, but it has the flair of a European dagger. Designed for efficient piercing, the skinner is also strong enough for heavy work with a full length, full width tang and ample nickel silver finger guard. The construction of the Skinner's handle varies from the usual flush fitting riveted design and makes the handle itself somewhat stronger than the old pattern. Stainless steel rivets compress brass washers (Puma calls them rosettes) into countersunk holes in the handle slabs, giving the knife a uniquely rugged look. That also makes the grip a little rougher than usual, so it's a point to consider if you're more into function than art. Puma's innovations sometimes become the mark of collector's pieces, so any new feature is bound to attract attention. Nine and 5/8" in overall length, the knife with full grain leather sheath weighs 7-1/4 ounces, fairly heavy for a small skinner today. Compare it to an equivalent knife built with modern synthetics, and the weight doesn't seem out of place. The 0.14" 440C stainless steel blade balanced with naturally dropped stag antler scales does not feel like a weightless toy. You'll never notice two or three extra ounces while hanging on the belt, but in the hand it makes a huge difference.